Black Lightning prepares for the season finale with the return of Tobias and forward movement on what the A.S.A. has planned for Freeland. In many ways this episode is more of a recap in preparation for the season finale and the episode greatly suffers for this as lots of it is filled with needless exposition. This has been a very plot heavy season especially for such a new show so it’s easy to see why someone might have thought an episode geared around letting the audience catch up with the main plot threads was necessary. One of the real strengths of this show has been the intricate world building and intelligent storytelling so this sort of recap was unnecessary as far as I’m concerned. Exposition for the sake of exposition is rarely a good thing because it often amounts to little more than one character explaining the plot to another character. This is exactly what we get when Tobias meets up with Proctor who outlines exactly what the A.S.A. have planned for Freeland and the elements that brought them to this point. This conversation does reveal that the A.S.A. are now no longer interested in Freeland and want to put the experiment to a close completely which does raise the stakes somewhat though that gets lost behind the detail that was thrown at the audience. It’s largely a waste of a scene because it reinforces information that the audience already knows in a way that isn’t interesting. Tobias does get brought up to speed with the situation but on the whole there is very little new here other than Black Lightning representing perfection as far as they’re concerned with his stable genetics being seen as the key to creating their own Metahumans. Naturally this is something that can’t be allowed to happen which makes for an interesting threat against Jeff and his family along with Tobias’ personal vendetta against Black Lightning. Thankfully not all of the episode is clunky exposition. There are a lot of fascinating and meaningful character driven exchanges. The return of Khalil after being subjected to an experimental treatment that allows him to walk again affects different characters in different ways. The most significant is Jennifer who had to deal with her first serious boyfriend suffering from a crippling injury. This was handled really well at the time with Jennifer feeling conflicted over her desire to help Khalil and the overriding sense that it was all too much for someone so young to deal with. I like that this was played as a realistic human reaction to something that she was unprepared for and having that be part of the reason a wedge was driven between them felt very real. At first Jennifer is really happy to see Khalil return because she isn’t a bad person and seeing him walk again brings her a lot of joy. It’s a good scene that outlines the basics of how Khalil came to be walking again but also reminds us of the pure and honest connection that existed between them before the accident. Khalil’s intention is to get back together with Jennifer and he admits that he wasn’t his best self following the accident so feels that he can make up for it now. Jennifer is reluctant to enter back into a relationship with him which is understandable given all she has been through recently and the scene becomes awkward very quickly. This is one of those scenes that works because the actors are entirely able to sell it and showcase the connection that has been built between their characters but also doesn’t work because Khalil is someone who hasn’t been seen for a while. His appearances prior to this episode were relatively brief and a small number of them concentrated on his relationship with Jennifer so the audience investment in this relationship and what it has become is diminished because Khalil is a character who all but disappeared and could easily be forgotten as a result. Khalil’s point of view is used to great effect in this episode throughout his interactions with various characters. He ultimately feels betrayed by Jennifer who he sees as giving up on him and has nothing but resentment for Jeff. The reason for that is he feels abandoned by Jeff following the accident because any support promised to him apparently disappeared. Whether it really did or not is up for debate but the important thing is that Khalil feels that it did and that resentment comes across as really visceral. This might have paid off better had the show established how alone Khalil felt when his support system apparently fades away. He even makes the point that Jeff’s support disappeared when it became clear that Khalil’s athletic career was over. It’s a really bitter and twisted outlook though there is an element of truth to it at least from his perspective. His relationship with Tobias is almost entirely transactional which also comes across as something of a betrayal from his perspective as Tobias approached him as a sympathetic benefactor at first and has now revealed that he only did that so that Khalil could be useful to him. This is put very simply by Tobias as “legs for loyalty” showing that he doesn’t see anything more to their arrangement than that and will use this to blackmail Khalil because he holds all the cards. I suspect this is starting to set up a scenario where Khalil will turn on Tobias and pay for that with his life but for now he’s the unwilling henchman forced into taking actions that he doesn’t want to. It is made abundantly clear that Tobias won’t let Khalil return to his old life no matter how much he wants to and that’s definitely a source of regret. The attack on Garfield High is a very profound statement on Tobias’ part. 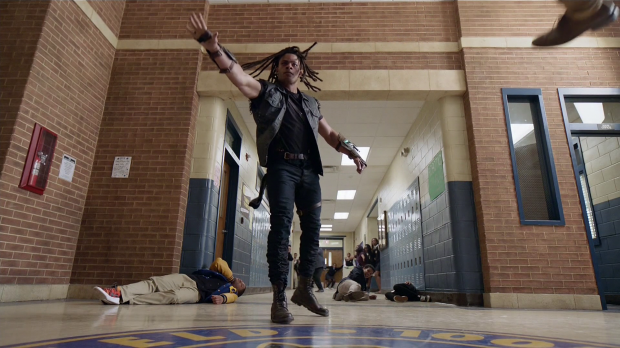 He rightly assumes that it will draw Black Lightning out because the school is a symbol of safety for many people so Black Lightning will make protecting the school a priority. Using Khalil to attack the school is also symbolic as he is now a corruption of what the school is supposed to stand for and terrifies the students who can see what he has become as he attacks them. As set pieces go this is a really good one. There are a lot of moving parts to it yet it never becomes overly cluttered and it is always clear what is going on. It’s really well paced with a few individual battles going on within the larger sequence where each of them builds tension in their own right. Anissa’s fight with Syonide (Charlbi Dean) is a particular highlight. It’s a great fight because both of them are evenly matched and Syonide shows how skilled she is when figuring out that Anissa is only invulnerable when holding her breath. She exploits this wonderfully which helps make the fight a really engaging one. Jeff’s hand to hand fight with Tobias is less impressive from a technical standpoint but makes up for it massively in the emotional connection. What we see is two men who hate each other trying to beat the other to death. 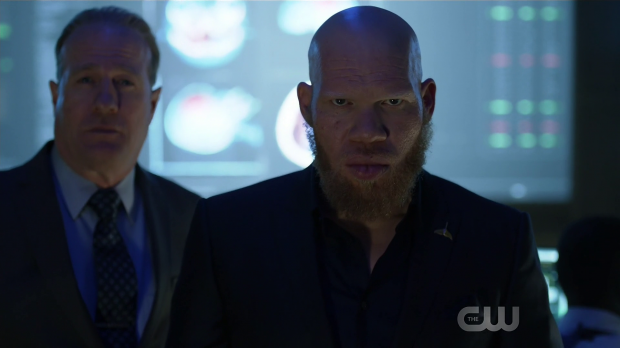 There’s a lot of weight to it because they are both fully committed to it and extra dimension is added with the knowledge that Tobias has to hold back because Proctor wants Black Lightning alive. The rage he shows when Khalil accidentally kills him shows how badly Tobias wanted to be the one to do it which counters the regret on Khalil’s face nicely. Both have different reasons for wanting Black Lightning to survive further adding to Khalil’s possible redemption arc. 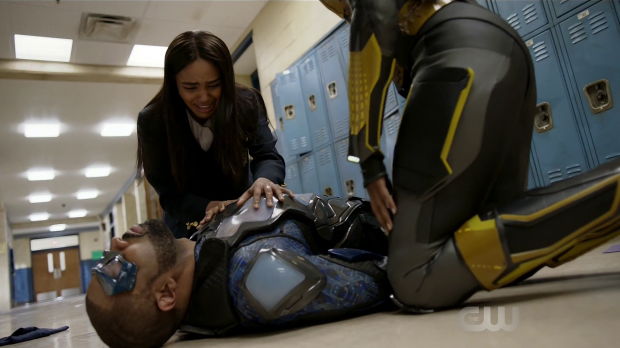 There’s a running theme around Black Lightning being the cause of Jeff losing things he holds dear in his life. The example here is Jeff and Lynn getting back together even if they choose to keep it a secret from their daughters for the time being. Their reconciliation is a moment of happiness between them that also marks a significant turning point for Lynn. 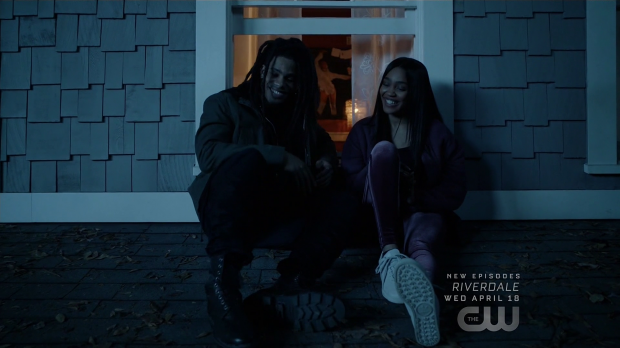 We’ve already seen her accept that Jeff is Black Lightning but her willingness to resume her relationship with him shows that she considers herself strong enough to accept what comes with that relationship. 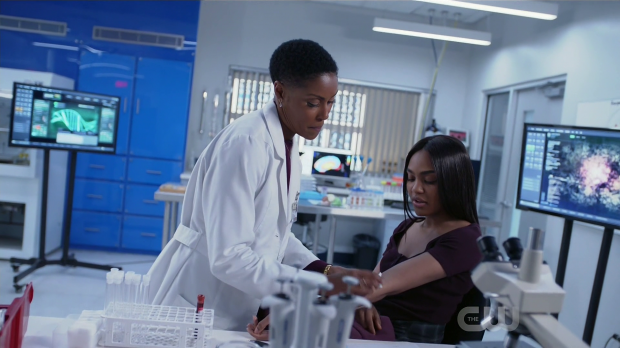 Cress Williams and Christine Adams are always great together and this makes for one of their strongest episodes together. The apparent bliss is short lives when Jeff overreacts to her looking into Jennifer’s powers. Jennifer assumes that Lynn is looking into getting rid of them when the truth of the matter is that she wants to understand them. If she happens to find a way to remove them then that’s a choice that deserves to be presented to Jennifer so that she can weigh up the options and make an informed decision about what she really wants in life. This is in keeping with how Jeff and Lynn have chosen to raise their children as it promotes a mature and respectful attitude. Jeff in the heat of the moment sees this as Lynn trying to take away what Jennifer is when that’s not what it’s about at all. I’ve always said that character flaws make characters feel more real and Jeff’s tendency to overreact in certain circumstances especially where his children are concerned is a consistent flaw that he has to overcome. Lynn completely agrees with him that her powers are a part of her but she also sees what to do with them as entirely her decision. It will likely take Jeff some time to realise that and it does feel a little soon to put a dent in their happiness. Jennifer’s approach to her powers has been relatively simple so far. She’s opposed to having them and has no desire to become a superhero which I see as a very valid position to take. This episode goes about changing her attitude when she finds her costumed father dead and activates her powers to bring him back. This activation is entirely accidental brought on by the extreme stress of the situation but it’s the first empirical evidence that she can use her powers to do good and I suspect her world view will alter somewhat based on this experience. Her overall helplessness in the midst of a crisis situation also contributes to this as she may realise that she no longer needs to be the victim. The episode spends some time dealing with Lala’s place in the hierarchy now that Tobias is back. Their interaction is brief but Tobias is clearly in charge and his use of the words “the devil deals the cards” as if it’s a hypnotic trigger phrase makes for an interesting dynamic as Lala becomes yet another person Tobias dehumanises in order to control them. A solid episode brought down by unnecessary exposition that does little more than summarise the major plot points up to this point. The world building and smart storytelling have done more than enough good work to set this up before now so this catch up wasn’t needed. Khalil’s return brings with it a lot of strong material such as his genuine reunion with Jennifer that quickly turns sour and a heated exchange with Jeff pointing out that his support system disappeared. The entirely transactional connection he has with Tobias is made abundantly clear as is the lack of possibility of returning to his old life. The episode has a great set piece in the form of Tobias invading the school using Khalil as a symbol of his ability to corrupt the safe place that is Garfield High School. Anissa’s fight with Syonide is a particular highlight showing real skill on both sides making for an interesting contrast with Jeff and Tobias’ anger driven brawl that has no finesse to it. Lynn and Jeff getting back together is a great development that furthers Lynn’s character though the happiness is taken away a little too abruptly when Jeff overreacts to Lynn studying Jennifer’s powers. This episode marks the first time that Jennifer realises that her powers can be used for good as well which may alter her world view somewhat.